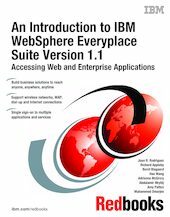 This IBM Redbooks publication is about building business solutions using the IBM WebSphere Everyplace Suite Version 1.1 product to enable Web and enterprise application access from pervasive computing devices. It helps you to understand this product and focuses on implemented architectures and technologies included in this release such as wireless communications, transcoding, security, caching proxy, load balancing, messaging, and single sign-on, among others. IBM WebSphere Everyplace Suite is an integrated end-to-end software solution for mobile e-business. In this book, you will find information that will help you plan to successfully implement solutions that businesses must address to be able to access Web and enterprise applications from desktop browsers and the new class of client devices such as WAP phones, Palm Pilots, WorkPads, and others. A basic knowledge of HTTP and WAP protocols as well as some understanding of Web and Java technologies (XML, HTML, WML, servlets, and JSPs) and the terminology used in Web and enterprise applications is assumed.